It’s fairly safe to say that there are few places left in the state of Michigan where strangers are not only greeted with a friendly smile and a tip of the hat, where hunters are not only welcome, but a cause for celebration. On top of that, not only is there a great deal of public land to enjoy that hunting, but, at the right time of the year, the hunting is nothing short of superb. But there are still a few places left like that, including a small spit of land 32 miles northwest of Charlevoix in the middle of Lake Michigan that early Odawa fishermen knew as the land of the beavers, and later Irish settlers described as the Emerald Isle-Beaver Island. 13 miles long and six miles wide, more than one third of Beaver Island is state land with remote Lake Michigan beaches and seven inland lakes, several of which offer public access. Garden, High, Gull, and Hog Island, all now uninhabited public lands, as well as the smaller Whiskey Island, Hat Island, and privately owned Squaw’s Island, make up the remainder of what is known as the Beaver Archipelago off the northern end of Beaver Island. Having already experienced the superb fishing, turkey hunting, and bird hunting of the Beaver archipelago, my son and I turned our attentions to the waterfowling opportunities of the archipelago on a recent sojourn on the island. With the October weather still warm, and fall migrations just getting underway, we set our sights on a species of duck many waterfowlers in northern Michigan aren’t extremely familiar with-the wood duck. Increasing in population throughout the state of Michigan in the last decade with increasing forest growth, wood ducks prefer quiet, warmer waters with readily accessible foods, all of which can be readily found on several of Beaver Island’s inland lakes, as well as the many wetland fens within the swampy, mostly inaccessible, interior of the island. Setting up before dawn in a natural tree stump blind created decades ago by a timberman’s saw, we dropped two pairs of wood duck decoys into the shallow water of a cove on one of the smaller inland lakes and made ourselves comfortable. What followed soon after was a sight I had never seen before and will certainly never forget-more than a hundred wood ducks arriving for breakfast, two or three at a time. “Take ’em!” my son finally called. A few minutes later we were admiring at close hand the amazing fall plumage of a drake wood duck. With a cold north wind blowing by afternoon and one of the first arctic fronts of the season visible on the horizon, we set up for the evening hunt along the shores of Lake Michigan, setting out a mixed array of mallard and diver decoys. As if on cue, a few minutes later we were treated to another amazing island sight-hundreds of bluebills flying the natural pass between Hog, Garden, and Beaver Island, the first of the fall migrations. 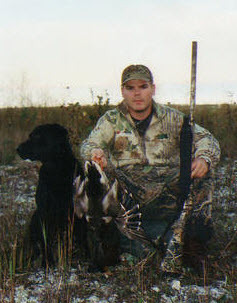 Michigan’s duck season is open in northern Michigan’s Zone 2 through November 26.